Magnetic cards: Buff or Minion? 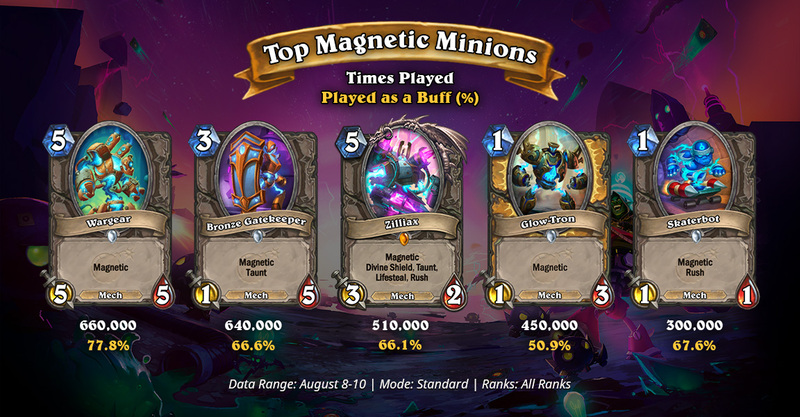 Along with Mechs, Magnetic was also introduced as one of the main new mechanics from The Boomsday Project. Exclusive to Mechs, this new Keyword allows Magnetic minions to be played as buffs to Mechs already in play (when played on the left-side of said Mech) or standalone creatures when played on the right-side. This gives players an interesting and skill-testing choice each time they play a Magnetic card: do I want to go wide or tall on the board? Depending on which class and archetype you are facing you might want to go one way or the other. Are Mechs and Magnetic here to stay? Giggling Inventor is the most played card from The Boomsday Project and 3rd most played overall in Standard while Zilliax is the most played Legendary card from the new expansion. Odd Paladin decks have incorporated cards like Glow-Tron, Giggling Inventor and Wargear into their lists. Token Shaman has been experimenting with Mecharoo, Replicating Menace and Giggling Inventor. Deathrattle Hunter has been using the powerful effects of Spider Bomb and Venomizer to their advantage along with several cards that summon Goblin Bombs for additional face damage. What do you think will happen to Mechs and Magnetic cards after this initial phase of experimentation ends? Let us know on Twitter, Facebook or Discord!